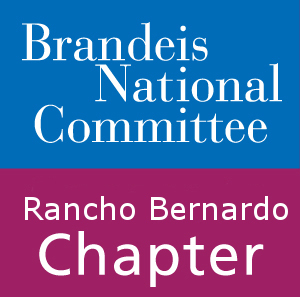 Welcome to the Rancho Bernardo chapter of the Brandeis National Committee! The chapter consists of a lively group of people from the greater Rancho Bernardo area. Our members share a love of learning and giving back to their communities, values reflected in their support of Brandeis University. BNC Rancho Bernardo supports the university’s libraries, student scholarships, and scientific research through fundraisers, special events, and study groups. We provide our members with social activities and learning opportunities throughout the year in order to stimulate minds, expand knowledge and encourage friendships. BNC Rancho’s study groups are designed to entertain, educate and provoke discussion. In order to ensure there is something of interest for everyone, our study groups and events encompass a broad range of topics. In the past these have included groups for literature, art, film, travel, local attractions, and current events. We are always exploring new topics in order to provide our members with the best experiences possible. Members will also receive emails and printed bulletins that detail events, highlight dates, contain important contact information and forms, and advertise news within the chapter. We are so excited to meet new members and reconnect with returning members for another BNC year!